Ken had a teaching career of over 45 years, beginning in rural schools where he gained an appreciation of the impact curling had in small communities. 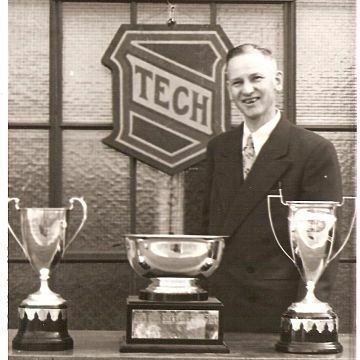 He joined the staff of Saskatoon Technical Collegiate in 1938 and remained there until his retirement in 1966. He was an above average curler himself, a keen student of the game and an outstanding coach. He was a perfectionist, leaving nothing to chance. He had a unique ability to prepare his teams both physically and mentally. Between 1946 and 1955 he coached his teams to 7 Northerns, 5 Provincial and 4 Canadian Schoolboy Championships. Responding to a suggestion from other coaches to “ease up”, he turned his attention to the executive side of the game. He served as the SCA representative to the CCA for High School curling from 1955 to 1966. At the request of Ken Watson, renowned curling champion from Winnipeg and the CCA, he published a booklet on his coaching methods that was distributed to High Schools all across Canada. In 1966 he was honoured with an Honourary Life Membership in the SCA. He was considered the “Father of Coaching” in the sport of curling.